One-third of the way into the 2013-14 NHL season, fantasy owners have seen quite a few curveballs when it comes to the goalie landscape. While top-flight goalies Tuukka Rask, Antti Niemi and Henrik Lundqvist remain top-five material, many of those who waited a few rounds to fill this important positional need made a wise choice. There's still a ton of hockey left to be played in the coming months, but the bottom line is many goalies who came into the season with high expectations surrounding them have either failed to live up to the hype (Sergei Bobrovsky, Craig Anderson, Jimmy Howard) or seen injuries define their season (Jonathan Quick, Pekka Rinne). Meanwhile, when you take the Yahoo average draft position (ADP) of the League's workhorse goalies into account, it's very clear who the most pleasant surprises have been. 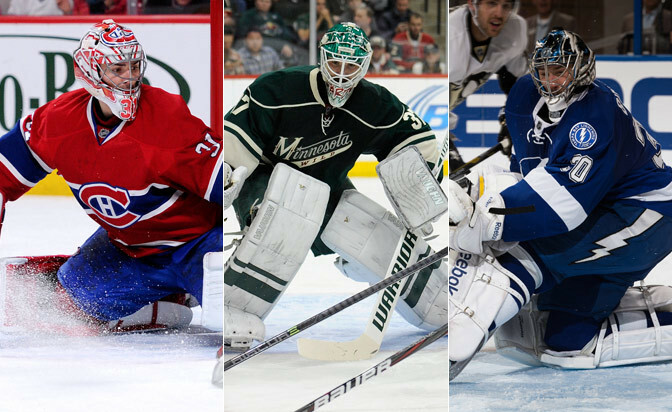 Here are five goalies that have maximized their value based on where they were taken in drafts. If you own one of these players, you've been in good hands so far. The Habs are near the top of the Eastern Conference standings, and no one is more responsible than Price. The ninth goalie off the board on average in Yahoo drafts has allowed two goals or fewer in each of his past nine outings and in 17 of 23 on the season. A borderline preseason top-10 goalie, Price has won six straight and is the only player with a goals-against average under 2.00 among those who have faced 700-plus shots on goal. Montreal's goalie coach, Stephane Waite, deserves a ton of credit for Price's return to form. Fantasy owners who took my offseason advice in regards to Fleury have reaped the benefits. Fleury, a perennial regular-season difference-maker, has bounced back yet again from playoff struggles to win 16 times in 25 games, tied for second in the NHL behind Corey Crawford (17). He's tied for the League lead in shutouts (three) and is in position to finish with the best single-season GAA of his career (2.01). He's also 10-2-0 with strong numbers across the board at home, making him a must-start player regardless of which team the Penguins are hosting on a given night. What Harding has overcome goes way beyond hockey. He was diagnosed with multiple sclerosis in October 2012, yet has emerged as the best fantasy goalie next to Rask in terms of category coverage this season. He went undrafted in many fantasy leagues, yet currently owns the best even-strength save percentage (.950) in the NHL among goalies with 20-plus games played. Harding stands among the top five League-wide in wins, GAA, save percentage and shutouts. We're running out of adjectives for how impressive he has played this season given the obstacles he has faced. Most fantasy owners would not have dared to take a chance on the Flyers goaltending situation coming into the season, let alone after their nightmare 1-7-0 start. But Mason weathered the storm, production-wise, and has since helped his team get its season back on track. The former Calder Trophy winner is among the League leaders in GAA and save percentage -- and has been especially reliable at even strength despite a heavy workload. He has allowed three goals or fewer in each of his 20 outings this season and is an ideal sell-high candidate if you have a surplus of goalies on your fantasy roster. The Lightning have stayed afloat after Steven Stamkos' injury thanks largely to the play of Bishop. He's one of six goalies NHL-wide with 15-plus wins and one of seven qualifying players with a sub-2.00 GAA. What's most impressive about Bishop is his 7-1-1 mark against the mighty Western Conference. It seemed feasible entering the season that Bishop could win the starting job outright over Anders Lindback, but no one expected him to play 22 of his team's first 28 games and earn a spot in the top-10 realm of fantasy assets at his position.